Wrapped around a widespread terrorism plot designed to shut down the entire country, Live Free Or Die Hard (directed by Len Wiseman) is surrounded by action sequences so unbelievable, so ridiculous, you have to question why they bothered crafting a plausible scenario to fuel them. John McClane has dodged bullets and falling debris — yet avoiding a fighter jet, blowing up a helicopter, and surviving an entire country-wide fuel-line explosion inside a van stretches even the logic of the Die Hard series. McClane’s story is a little too reminiscent of Bruce Willis’ prior 16 Blocks, in which a small town cop is caught up in a transportation situation far larger than he expected. Those who believe Willis is too old to be taking on the McClane role are far off base. Even at 52, there’s no question he fits right in. Tasked with moving a computer hacker (Justin Long) to custody, Willis is suddenly entrenched in a plot to, literally, bankrupt America. The cyber-terrorism concept is eerily believable (if not plausible in the least), and it’s a shame there are so few shots of the country in a state of panic. The ones included are wonderfully handled. Of course, even with the entire government attempting to stop this plot, it’s the small New York detective and trusty unwilling sidekick hacker who manage to outwit them all. For a summer movie, that’s fine. McClane surviving multiple barrages of gunfire is acceptable. A few close calls for the sake of drama are necessary and fun. What’s not acceptable is McClane surviving a fall from an exploding jet, an entire bridge collapsing on top of him, a deep fall from a window, multiple shattering glass frames, a leap from a car easily hitting 60 on the speedometer, a semi truck smashing into a ridiculously durable wall behind him, missile attacks, a car falling down an elevator shaft, and of course the countless explosions that never seem to be moving fast enough to catch up. Yes, the Die Hard series has always been overdone fun. However, there’s always a baseline for the audience to suspend their disbelief. Anyone one of those above miracles would have been placed just fine. All of them in the same movie comes off as a sad attempt at one-upping all other action movies since Die Hard: With a Vengeance back in 1995. You’re not focusing on the intensity of the action or the special effects. You’re marveling at how durable a single guy can be. The action sequences are stunning, with blistering and flat-out flawless special effects almost the entire way through. Simply put, you will never see a fighter jet miss such a massive target so blatantly again with results like this. It’s unquestionably something to see in terms of film visuals. This just doesn’t fit in with the Die Hard series and doesn’t even remotely make an effort to stay in the same mildly believable realm of the first three. This is all about overdoing it for the sake overdoing it. It’s jarring to see McClane take a massive fall, limp away with blood pouring from his head, and a few short minutes later start running down a street like the previous injuries have never occurred. It takes away from the enjoyable script work on the American attack. At the least, you can laugh all the way through, as the witty one-liners are constant. Kevin Smith’s small role as a fellow hacker leads to some of the most enjoyable sequences to be had here. 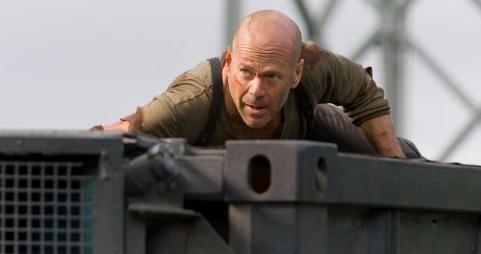 Other characters, particularly McClane’s daughter Lucy (Mary Elizabeth Winstead) are simply lost for a significant part of the film. After the opening scene, she disappears until a few minutes before the finale is set off. Her presence is wasted, in terms of her performance and usefulness to the plot. Timothy Olyphant leads the villains, though he never quite reaches the cold-hearted status of Alan Rickman in the original even though the scale of his insanity is unparalleled for this series. It’s odd to see how far the series has come. The original’s closed office-building scenario was contained, the second opened things up to an airport, the third took most of New York with it, while this fourth entry tackles the entire country. We’re only one step away from Willis becoming an astronaut to save the world from some giant asteroid… err, we’ve done that. Of course, given the amount of logic in Live Free, that wouldn’t be much of a stretch. Live Free is loaded with impressive visuals. Close-ups reveal amazing facial detail, and the contrast created by the rich blacks is wonderful. The color saturation is phenomenal, and the print is flawless. A light film grain gives the film texture. The transfer does take a small hit in darker scenes, dropping detail into the black levels and giving off a murky look. These are brief (the tunnel car chase), and barely detract from this sharp looking movie. The DVD edition suffered from overwhelming bass, the DTS Master mix here gets it right. The room crumbling bass is saved for the heaviest explosions, and gunfire delivers a proper level of kick. The use of the surround channels is nothing short of masterful, with debris flying around, cars passing through each speaker, and bullets lighting up the room as they whiz by. A commentary from Willis, Wiseman, and editor Nicolas De Toth leads off the superb extras. Their expertise is varied, as is their discussion on how the film came together. Analog Hero, Digital World –The Making of Live Free or Die Hard almost makes the commentary pointless at a whopping 97 minutes. Nothing is left to the imagination here, as every major scene is dissected, as is the franchise in general. Yippe Ki Yay Motherf***** is a sit-down discussion between Willis and his character, John McClane. Their conversation is fun, lighthearted, and surprisingly deep at times during this 22-minute piece. The title is proper since the PG-13 version of the film (the one included here) edits the famous line. A music video by Guyz Nite is a fun tribute to the series, though the feature on the band wears out its welcome after the first minute. Fox Legacy is a far too brief look at the Die Hard series from the Fox vault. It runs for slightly over six minutes. A rather mundane Black Hat Interceptor Game will excite or intrigue approximately no one. Its only highlight is Kevin Smith in character.